eshots has brought something completely new to the market, a platform that will improve the consumer experience while driving a higher ROI for show owners and brand marketers alike. 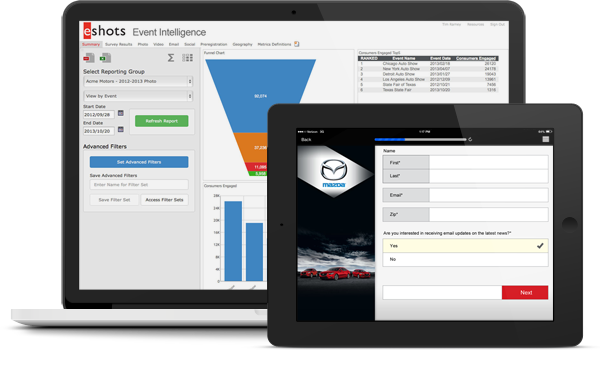 epass from eshots is the central hub that streamlines all consumer touch-points, dramatically reducing bottlenecks that typically arise at large-scale shows by creating the strongest engagement opportunity ever seen at large-scale events. Trusted experts at helping enterprise brands capture and convert consumer leads from their live experiential marketing. Our event marketing technology and services powered over 25,000 event days and captured over 3,000,000 consumer leads in the last year alone. Our experiential marketing technology has powered some of the leading enterprise brands in the world over our two decade history, and they’ve honored us with industry-leading satisfaction scores (net promoter score of 73). CMOs are evolving into CTOs and are demanding better data-driven decision making and accountability from their marketing teams, including experiential marketing, to preserve and grow future budgets. Experiential Marketing is no longer a cost, it's an essential investment for any organization! Here’s a small sample of the enterprise brands who have used the eshots experiential marketing platform recently to make more informed decisions and drive higher event ROI. We respect your privacy and do not sell your info.